QF: def. Janet Newberry (USA)/Raul Ramirez (MEX) 2-6, 6-3, 2-3 ret. * Evert and Sue Stap teamed up to beat Janet Newberry/Eliza Pande 6-3, 1-6, 6-3 in the doubles final of a 4-woman exhibition event folded into a men’s tourney in Charlotte, NC. Fittingly, Chris earned her first professional doubles trophy by teaming with her sister. Betty Ann Hansen later known as Betty Ann Stuart Dent. Martina also defaults the singles final to Chris. NOTE: 1975 was by far Chris’s best year in doubles (8 titles). She not only continued a formidable partnership with Billie Jean King, she teamed with Martina Navratilova to collect the French and Italian titles as well as the doubles crowns at four Virginia Slims tour stops. In 1976, the Chris-Martina team would qualify for the Virginia Slims doubles finals and go on to win Wimbledon and the inaugural Colgate Series Championships, but as has been well-documented, their budding rivalry in singles was shortly to curtail the doubles activity. NOTE: Chris was paired with Rosie Casals for one of the first times in the 1975 World Invitational at Hilton Head in 1975, where the doubles “final” was an exhibition showcasing the four women vying for the singles crown. The Chris and Rosie partnership soon became a mainstay of Wightman Cup play and also helped the U.S. to its 1977 Federation Cup victory. Chris and Rosie played together on tour in 1977 (taking four trophies including the Family Circle Cup) and in 1979 (when they qualified for the Avon finals and the Colgate Series finals in doubles and had their only splashy result in a Grand Slam together, the semis of the U.S. Open.) Chris won 7 titles overall with Rosie. Chris also defaulted a singles SF to Virginia Wade. Did not play doubles in Wightman Cup. NOTE: in the mid-1980s, Chris seemed to develop a policy of inviting those players who pushed her to a third-set tiebreak in singles to team up with her in doubles. –After a 6-3, 3-6, 7-6 win against LESLIE ALLEN in Oakland in 1982, Chris played Amelia Island and Paris with her. 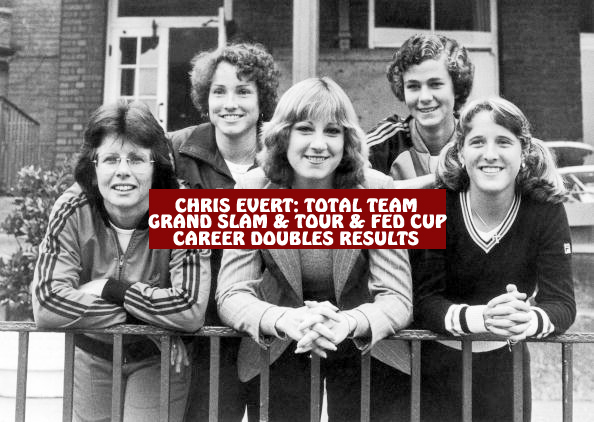 –After Chris edged CATHERINE TANVIER of France 5-7, 6-2, 7-6 en route to the Brighton title in fall 1983, they went on to play Wimbledon and the Canadian Open together in 1984. 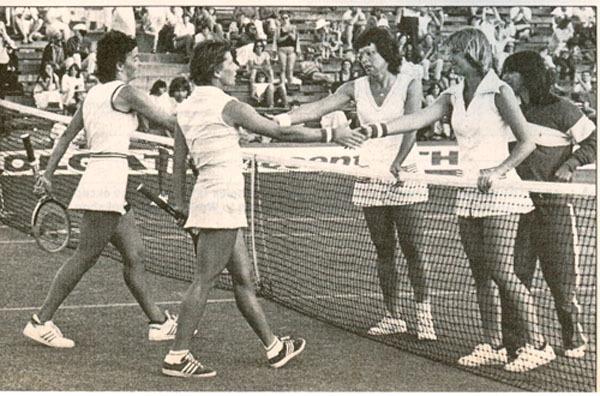 –After CATARINA LINDQVIST produced another scare in a Brighton quarterfinal in 1985 (Chris won 6-2, 2-6, 7-6 and again marched on to the title), she and Chris partnered up at the Australian Open and authored an upset of Mandlikova-Turnbull. SF. def. Betsy Nagelsen/Anne White (seeded 2) ????? NOTE: Although Chris played doubles with Wendy Turnbull at the 1980 French Open, this year’s Manhattan Beach victory serves as the beginning of a more regular partnership. They take 5 titles in all together. In 1988 they have a fantastic year in the major events, reaching the finals of Australia, the semifinals of Wimbledon, and the quarters of the Lipton and the U.S. Open. *When the U.S. lost the decisive doubles match in the final, it was the only Federation Cup defeat the U.S. ever sustained with Evert’s participation. Wendy had a toe injury, also retiring against Chris is the SF of the singles.